Looking out my window today, across our front perennial beds, I was again struck by the sheer volume of lawn in my subdivision. So I will be embarking on a brief series of posts about yards, their costs, and the beautiful solutions to the ‘traditional’ American lawn. 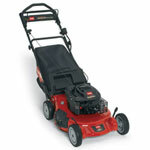 First in the cross hairs will be the ubiquitous gas lawn mower. Right now you can’t go buy a converter to add to your mower, so how do you keep you lawn snazzy and your air clean? When we lived in our last house we had a small .1 acre yard that I mowed with a reel mower (great info @ clean air gardening), and when we moved out to our larger .5 acre yard I vowed to keep that little mower. If you keep the lawn short, it mows very well with less effort than horsing around an 80lb gas mower. It’s safer-I typically mow while our two small children play very nearby. It’s quiet-I can mow at 6am on a Sunday, or watch finches at the feeder oblivious to my presence. In fact I find the soft whoosh-whoosh of the spinning blades very soothing-can’t say a Toro ever did that! It’s dang cheap-we paid under $100 for our Craftsman and the only maintenance is a sharpening (takes 20 minutes and if you can turn a crank clockwise you’re qualified) once every 2-3 years. Downside? Taller weeds don’t get cut, and the lawn needs to be kept under 2″ tall- much shorter than is healthy for an organic lawn. Reel mower not tripping your trigger? Try a rechargeable one from Black and Decker-if seen them at Menardies for $350, or get one with a cord for half that. Still whisper quiet and low maintenance-though they cost 2-4 times as much and have some safety concerns around the kiddies. Unless you are off grid they are using energy for lawn maintenance, but it is a fraction of a gas mower and you can grow the grass longer reducing your watering and weeding. Running with abandon down the slight hill in our backyard with my 4 year old is easily worth the half hour of mowing it takes a week. But the amount of lawn it takes for that is about as much as I need for about the most space intensive outdoor activity I can think of-setting up a volleyball net for a summer party. And that is about as much lawn in the back as I would like to get to. If you too are finding that you would like to reduce your lawn while increasing the enjoyment from your yard, there are several options-most of them easy, some of them cheap, and all of them beautiful. No I am not off my rocker. Okay maybe a growing amount of people think so, but orchards are surprisingly easy. Intimidated by Apples and Peaches? Then try small fruit! Raspberries and blackberries are so easy to grow that some cultures treat them as weeds. They are crazy cheap and need very little care other than some pruning each year. And don’t let the pruning scare you! Raspberries pruning is child’s play-at the end of the season if the cane is brown and barky, its done fruiting so hack it off and compost it. Boom-you’re done pruning. Still too hard? Get an everbearing variety and cut all the canes down each fall. Simple as pie… really, really, good raspberry pie! And why are you afraid of Apples and Peaches? First read: The Backyard Orchardist to become an instant expert and then get going. Plant a dwarf variety and you don’t need a ladder to pick them, infact in an area about 20′ by 30′ you can grow at least 2 trees each of Apples, Peaches, Pears, and Paw Paw (look for a future post as I try just that!) here in zone 4/5. 600 sq ft of lawn gone and even more food for your family! My orchard will be two rows of trees with strawberries as a groundcover and a meandering clover path down the middle and sides for access, nitrogen fixing, and beneficial insect attraction. Last year I planted 125 strawberries. That sounds like a lot-and it is. In fact everyone thought I was loco, but eating a quart of fresh, incredibly sweet strawberries every day in June was perhaps as close to culinary heaven as I can get. Even though they are not very local or small farm-I use Nourse Farms for all my small fruit. They are crazy cheap, offer heirlooms, have good quality and, well, they’re crazy cheap. If you can find local fruit plants buy them! We have 3 island beds and our house is literally surrounded by 4′ to 6′ of perennial beds. Of all the de-lawning we have done this has had the biggest impact in sq footage: over 2000 sq ft so far. By choosing hardy, drought tolerant plants (Mediterranean varieties do well both wet and dry as do natives) will cut your watering bill immensely. A trip to the library will help immensely with planting ideas to stretch the bloom across the summer, or get the Prairie Nursery’s Catalog for some great garden ideas. Putting in perennial beds can be expensive- there is no doubt. We went in big the first year, and are adding about 500 sq feet each year with splits and a few extras from the nursery that catch our eye. Local garden clubs often have plant swaps, or even better ring the bell of that beautiful house on the corner whose flowers you have always admired. For the price of some conversation you will almost certainly leave with more splits than you can carry, and will have made a human connection in your neighborhood. Gardeners love to talk shop! As perennial beds are often plant once deals, do the soil prep and weed prevention right-incorporate lots of organic matter and compost, and lay some weed barrier (newspaper works great) and then mulch the dickens out of it: at least 4″, 6 would be better. Your village Public Works or utility will almost certainly have a pile of free wood chips if you give them a call. If you want/need something more decorative put the free chips down 4″ deep and top dress with the ‘pretty’ stuff. Personally the free stuff looks fine to me. The added benefit of surrounding your lawn with gardens is that you can sculpt the perimeter to round off all sharp corners-drastically reducing mowing time. Perennial beds also don’t have to be all flowers-edilbe landscaping works. We have several fruit bearing shrubs in our gardens, and sunchokes are beautiful sunflowers in late summer, and a tasty potato substitute after first frost. You don’t have to mow a deck! To be eco-riffic find some sustainably harvested cedar or redwood for the deck, or if you are going for a patio use a permeable stone patio instead of a concrete slab. Not only does this drastically reduce water runoff, but you can also get very creative with the seams-plant some thyme in the sand between the stones to add some fragrance to your evenings. Also, you can go 3-D and raise an arbor over your patio-not only does this keep the sun off, but it also happens to be a great place to grow clematis, grapes or kiwi to not only keep you cool and shaded, but from getting hungry as well! Figure at least another 250 sq ft gone. Finally I would be remiss if I did not mention the great selection of organic lawn fertilizers out there-we buy a pelletized fertilizer for under $10 a bag and have no problem keeping up with neighbors on the Scott’s “Pay Us to Poison Your Children” Program. Don’t be scared off by the low N-P-K numbers-the Scotts stuff is only around until the first good rain, and then it is off causing algae blooms in your local creek, where the organic fertilizer is a slow release fertilizer that is feeding the soil to allow it to better feed the plants. More nitrogren just gluts your plants, increasing the likelihood of pests, and burns off the carbon in the soil locking you into a viscous cycle of chemical inputs. When you do water your lawn do so in the cool of the morning on a still day-most of the water applied in the hot afternoon sun evaporates. Upfront and transparent: I’m Stuart and I work for ZIng, a PR agency that represent Hills Hoist, who are launching a new initiative in the US to try and change Line Drying habits. There’s over 88 million electric dryers in the US alone, each emitting in excess of one ton of carbon dioxide per year. So line drying is a great way to help reduce your carbon foot print! Check out our social media release – http://blog.linedryit.com/2008/05/linedryit—soc.html – to see what you think!! !